We manage the process of generating polyclonal or recombinant Monoclonal antibodies and antigens and subsequent purification, titration, delivery optimisation, immobilisation and sensitivity & specificity analysis for use in whole blood, plasma and urine-based assays. Medtechtomarket delivers rapid prototypes, proof of principle experiments and fully functional immunochemistry tests within a short time frame. 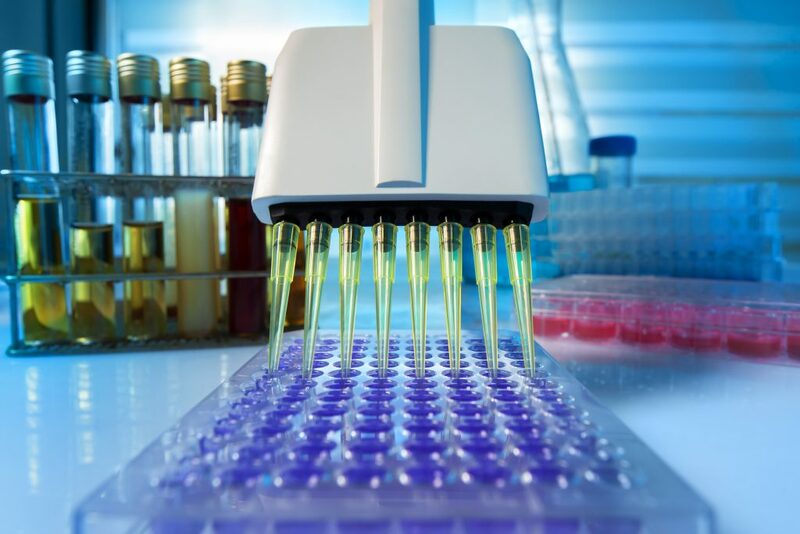 Utilising quantum dot, latex particle, colloidal gold and Europium conjugation, amplification and detection methods our technologies can detect samples by absorbance, luminescence, fluorescence intensity, time-resolved fluorescence and immunoturbidity. Within our advanced biochemistry labs, we develop and optimise the reagents with traditional ELISA methodologies initially within 384-well or 1536-well microplates, allowing us to titre the reagents, assay linearities, precision and detection sensitivity using 1-5µl sample volume.